EDUCATION: Tufts University (B.S., 1992); Boston College Law School (J.D., 1995). REPRESENTATIVE CASES: Acosta v. Harbor Holdings & Operations, Inc., 674 F. Supp.2nd 351 (D.P.R 2009); Sánchez Santiago v. Guess, Inc., 512 F. Supp. 2d 75 (D.P.R. 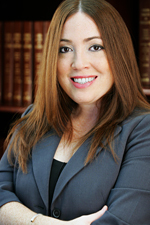 2007); Marina Águila v. Den Caribbean, Inc., 490 F. Supp.2d 244 (D.P.R. 2007); Segarra Jiménez v. Banco Popular de Puerto Rico et als., 421 F. Supp. 2d 452 (D.P.R. 2006); Arce Montalvo v. Hospital Buen Samaritano, 384 F. Supp. 2d 515 (D.P.R. 2005); Claudio Gotay v. Becton Dickinson del Caribe, 257 F.Supp.2d 498 (D.P.R. 2003); Figueroa López v. Hilerio Padilla, 199 F.Supp.2d 1 (D.P.R. 2002); Justo Cruz Ramos v. P.R. Sun Oil Co., Inc., 202 F.3d 381 (1st Cir.2000); Jorge Rodríguez Cuervos v. Wal-Mart Stores, Inc., et al., 181 F.3d 15 (1st Cir.1999); Costa del Moral, et al. v. Servicios Legales de P.R., et al., 63 F. Supp.2d 165 (D.P.R.1999); El Mundo Broadcasting Co. v. United Steelworkers of America, AFL-CIO, CLC., 116 F.3d 7 (1st Cir.1997). MEMBER: Member of the Federal Bar Association, Labor Relations Practitioners Association and the Board of Directors of the Alumnae Association of Academia Maria Reina (2015-2017).